Data sorting is an integral part of data analysis. It is incremental in helping users find, order and manage the information they need when working with large amounts of data. Ranet OLAP users now have an opportunity to set up and apply data sorting for rows, columns and data areas in the pivot table via the context menu. Users can quickly sort pivot table data in ascending and descending order using the respective commands from the context menu (they are applied to caption by default) or set sorting manually by using the Sort Options command. 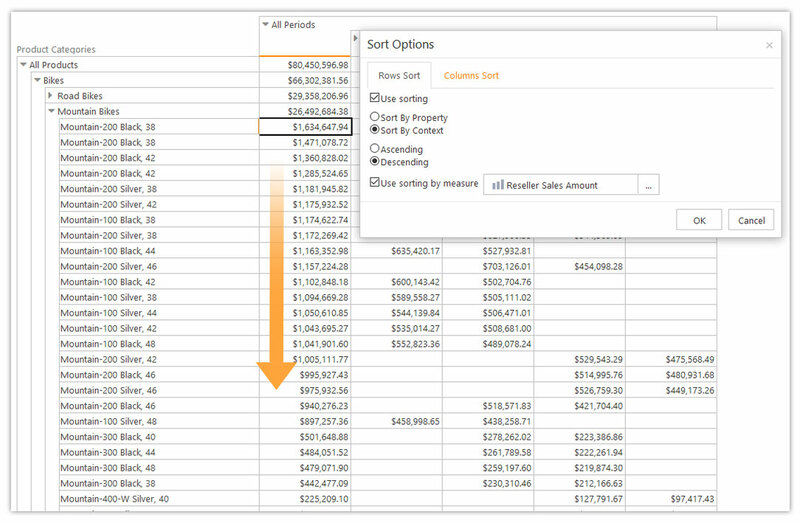 Users have an option to set up sorting for rows and columns, by property or by context. Sort by Property allows sorting data in the hierarchy according to a certain property, either caption (the element’s name) or KEY0 (the element’s key, or UniqueName). Users can sort the data in the pivot table’s rows and columns simultaneously, applying different rules. The figure below shows an example of a pivot table with columns sorted by KEY0 in ascending order and rows (Mountain Bikes hierarchy) sorted by caption in descending order. Sort by Context allows sorting the pivot table data according to the data context, which is defined by the cell’s coordinates. Users can choose the Measure by which to sort the data (it can differ from the Measure used to generate the pivot table). After the sorting is applied, the coordinates of the focused cell within the pivot table stay the same. 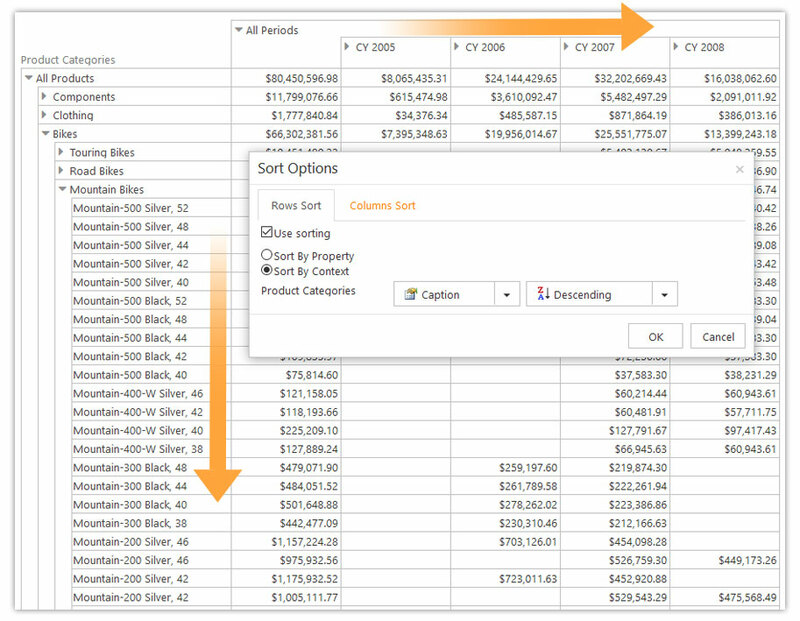 In case users visualize the pivot table data on charts, all sorting changes are reflected on the charts automatically. Read about other new features introduced in Ranet Pivot Table for HTML 5.7.150 in our new post.